RUMFORD - Daniel "Dan or Danny" N. Veilleux "Coach", 55, went to be with his Lord and Savior on Friday, Feb. 8, 2019 at 10:35 p.m. surrounded by the loves of his life. RUMFORD – Daniel “Dan or Danny” N. Veilleux “Coach”, 55, went to be with his Lord and Savior on Friday, Feb. 8, 2019 at 10:35 p.m. surrounded by the loves of his life. He grew up in Augusta, lived in Lisbon for several years and more recently of Rumford, Maine. Dan was born the son of Normand G. and Therese G. (Labbe) Veilleux on May 21, 1963, in Augusta Maine. A certified member of the PTR (Professional Tennis Registry). 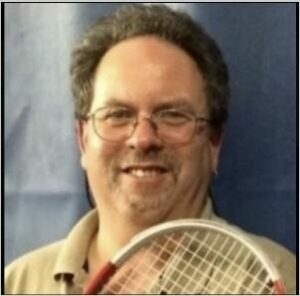 He was employed with the Kennebec Valley Tennis Association, in Augusta, for the past 40 years. Dan’s thoughtfulness, integrity and love were felt by all those who knew him and those who shared his life. His passion and love for tennis, fueled him and enriched his life in many ways. He gave of himself daily to the things that people needed most. There was no end to his giving spirit, and the joy that he so graciously shared. We will continue to honor him and his beautiful memory by continuing his work with the homeless, youth tennis, and the less fortunate. He was an amazing man and will be missed tremendously. Dan’s lessons will forever hear him whispering in their ears “bend your knees, get off your heels, and follow through”. Dan is survived by his father, Normand G. Veilleux of Augusta; his sister, Jan M. (Veilleux) Wright and her husband, Barry, of Chelsea; his niece, Brittany (Yorks) Vought and her husband, Luke of Oakland; and his nephew, Simon Yorks and wife, Michelle Yorks of Augusta. Along with many aunts, uncles, cousins, and friends. He is also survived by his fiancee, and love of his life, Margaret (Peggy) Collette of Rumford, and also her family members, her mother, Vernice Collette of Rumford, and sister and brother-in-law, Cindy and David Thorne of Steep Falls and their children, Ethan, Hailey, and Nicholas. He was predeceased by his loving mother, Therese G. (Labbe) Veilleux. A celebration of life will be held at, a later date at the Kennebec Valley Tennis Association (KVTA), 23 Leighton Road, Augusta, Maine. Please visit the KVTA’s website @ kvtatennis.org or their Facebook page: Kennebec Valley Tennis Association. It is with sincere appreciation and gratitude that we thank the amazing and outstanding staff and doctors at CMMC hematology/oncology, medical/surgical doctors – Daniel Rausch, M.D. and Lisa Rutstein, M.D., and their truly exceptional staff, for their expertise, support and care. We would also like to thank CMMC M1 nurses and providers for the excellent, empathetic and loving care Dan received in his time at CMMC. We could not have had the strength to go through this ordeal without the wonderful support from everybody including spiritual care, ICU, M1, ER, nursing techs, housekeeping, nutrition staff, transportation services, radiology, etc…. Thank you from the bottom of our hearts. We have tremendous respect, appreciation and affection for you all. In lieu of flowers please make donations to the Kennebec Valley Tennis Association Youth Tennis Program, or the Bread of Life Homeless Shelter of Augusta, Maine.